Here it is, the monster bass weighing 19lb 4oz, that was caught and released by Wayne Milton, aboard Roger Lennon's Skerry Belle out of Ramsgate, Kent. The porbeagles are being caught off Cornwall. This one, estimated at 400lb, fell to Ian Tyldesley, of Ammo baits, while fishing on Sam Narbutt's Bluefin Charters, out of St Ives, Cornwall. Released at side of boat. A three-year quest to catch a bluefin tuna in UK waters finally ended for big-fish enthusiast Andy Griffith when he boated a 300lb specimen. The angler, from Kent, hooked the big fish during a session aboard Andrew Alsop’s charter boat, White Water 2, out of Milford Haven, Pembrokeshire. It took nearly an hour for Andy to land the fish, which he caught on a homemade deep-diving lure. 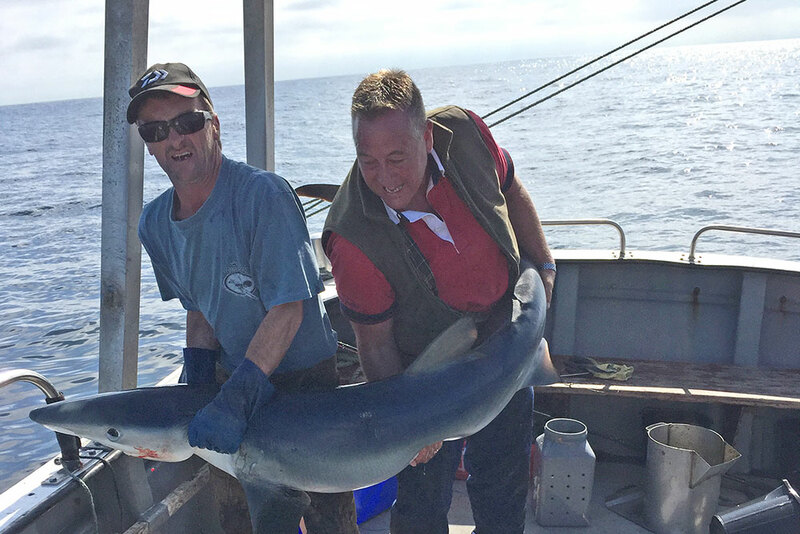 The fish, which was released, means Andy now holds four Welsh records following his grand slam of three different species of shark in a single day back in 2013, when he boated a 167lb blue shark, 235lb porbeagle and a 194lb shortfin mako. “I have been after a bluefin since 2013 when a big specimen stripped my reel while shark fishing, so it’s fantastic to finally achieve it, and also to have four records to my name,” he said. A bass fishing trip in North Wales turned into an incredible session for tope. Fishing at a beach near Barmouth, Gwynedd, on September 16, Lee Hunton, of Crewe, Cheshire, caught a tope estimate at 40lb (it was 5ft 6in long). The big fish was caught on a Greys BZE Bass 1-3oz rod and a Penn fixed-spool reel loaded with 15lb mono, with a running leger rig with size 3/0 hook and a Ammo frozen sandeel as bait. The fish took 15-20 minutes before Lee’s dad Tim could tail it. “The fight was spectacular, with numerous screaming runs and the fish jumping clean out of the breakers," said Lee. A new survey launched in October is seeking to recruit UK anglers for the Sea Angling 2017 catch and spend diary project, data which is anticipated to reveal more about the state and value of sea angling to the UK. Sea Angling 2017 is an exciting project in which up to 1,000 sea anglers will be selected to complete a bespoke online catch diary next year and provide information about what they spend. The project seeks to account for what is caught, kept and released and what sea angling is worth, across the whole of the UK. The survey is commissioned by the Centre for the Environment, Fisheries and Aquaculture Science (Cefas) and is being carried out by research company Substance, who have undertaken a wealth of research to support the development of angling in the UK in the last decade. The first stage of this project is the Sea Angling 2017 survey in which anglers will record what sea fishing they do and whether they want to take part in the study. Those wishing to take part in the survey or find out more about the project should visit www.seaangling.org. - A personalised online dashboard to show their activity and catches. 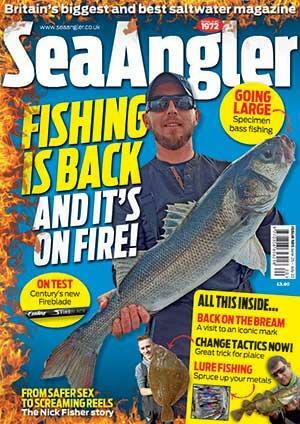 - The chance to win tackle vouchers from Fishing Megastore. All those who take part in the initial survey will be entered into a draw for 2x£50 tackle vouchers from Fishing Megastore. And those taking part in the diary study will be able to enter a draw for Fishing Megastore vouchers in every month they enter data next year. The survey aims to collect data that is as accurate as possible about what is caught, released and spent by sea anglers in the UK. This will help enable the sea angling community to demonstrate its real impact more effectively. The data collected will be published and provided to national and local policy makers to make better informed decisions on fisheries management, as well as provided to the sea angling community with information to enable them to develop their own views and policies. Alex McKay, of Liskeard, Cornwall, was fishing with charter skipper Murray Collins, aboard his boat Swallow. Tim’s porbeagle comes alongside the boat. The giant fly that accounted for the shark. A monster porbeagle has been caught from British waters by an angler using fly-fishing tackle. The shark, estimated to weigh 380lb and thought to be the largest ever taken on a fly, was claimed by Wiltshire angler Tim Westcott who battled with the fish for over an hour while aboard Jerry Rogers’ Fast Cats charter boat out of Cornwall. Tim claimed the porgie while purposefully targeting the species. It’s the latest in a two-year campaign that has seen him land numerous other specimens, including a blue shark of 151lb... also on the fly. The 54-year-old used a Bloke Shark Master 7ft rod with 400lb trace and 250lb leader with 70lb fly line, ending in a hand-sized baitfish imitation fly coated with Fish-Dynamix’s Mackerel Wand flavouring. He said: “The take came just 10 minutes into the session. Jerry knew it was a big fish but I thought he was mucking around as for a few minutes I still had plenty of line on the reel. Then all hell broke loose and it took me most of the remaining time to recover all that line. Tim began his fishing career targeting tiny perch and roach on a local pond before moving to fly fishing for pike and carp on estate lakes and the Bristol Avon. He was further inspired by Angling Times columnist Dom Garnett’s ‘Fly for Coarse’ campaign and made the life-changing decision to target more substantial quarry: “To say that I’ve had to beef up my gear to be able to deal with these incredibly powerful predators is an understatement,” he continued. “Playing those huge fish on light fly tackle is an amazing experience, and is totally addictive. The Angling Trust is seeking talented Youth (17-21 years of age) and Senior boat anglers to come forward for the FIPS-M World Boat Championships which are being held in Croatia from 30th April to 7th May 2017. ► Youthany Angling Trust individual member aged between 17 and 21 at the time of competing. ► Senior any Angling Trust individual member aged 21 or above at the time of competing. Download an application form from Angling Trust website or email sandra.johnson@anglingtrust.net. Your application must reach Angling Trust by no later than 30th September 2016. Applications are being sought for Managers and Assistant Managers for all Marine World Championships and Home Internationals. Open to all individual members of the Angling Trust who feel they have the requisite experience and aptitude. Seeking applications earlier will give the England Marine Selection Committee the opportunity to involve Managers and Assistant Managers in the selection process, and they will also look at offering them a longer commitment working in a managerial position. Download an application form from the Angling Trust website or email sandra.johnson@anglingtrust.net. Your application must reach Angling Trust no later than 31st October 2016. Next year FIPS-Mer will be staging a Veterans’ World Shore Angling Championship. The rules will be the same as for a normal World Shore Championship and the competition will be held in Spain. Full details are still to be confirmed, but applications will be open to any individual members of the Angling Trust who will be over 55 at the time of competing. Your application must reach Angling Trust no later than 12th December 2016. Application forms for all the other Marine World Championships and Home Internationals are also available.